Just figured I’d write a quick note about what’s happening with the latest dev channel release. A current version with the river tool has dropped to the alpha testing team a week ago; changes and additions are still being added at this point before the Dev Channel release. 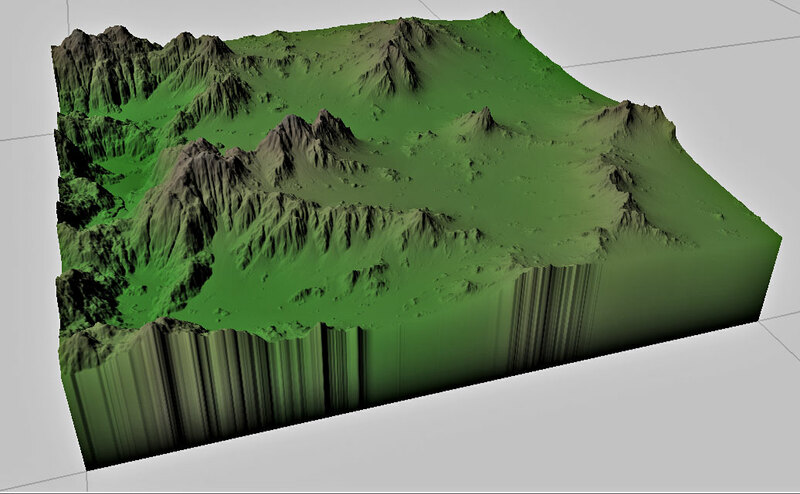 The Scene View device is an extension of the Overlay View, that accepts additional inputs over and above a simple terrain/bitmap combo. 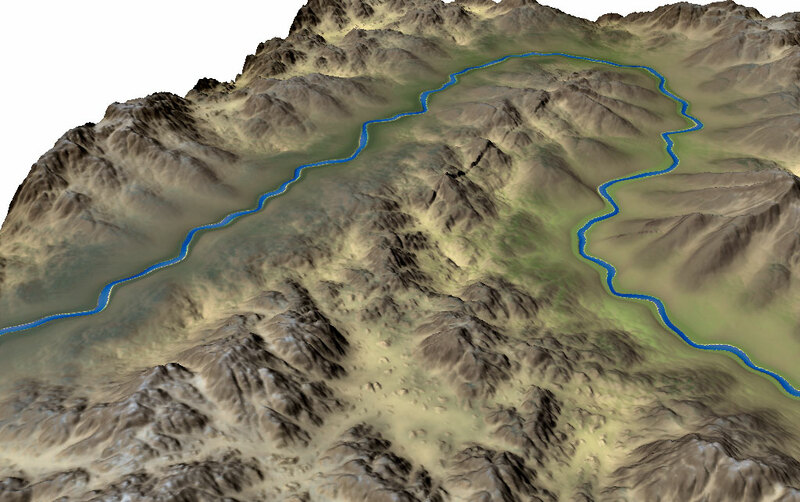 The first additional input is what is shown above: you can supply a water depth or watertable map which will be superimposed upon the terrain, allowing you to preview the water surface of your rivers instead of just the riverbed. Another key eventual purpose is to help with workflows using splat maps, where it’s hard to visualize the final result within WM itself. The Scene View will eventually accept your splat (guide) map and also the set of textures you intend to use in-engine and display them appropriately; this should give you less round-trips to the game engine when doing basic map design. The rough control possible in the Curves device has been a complaint of everyone (including myself!) for a long time now. The Layout curve editor was better but still only let you have linear segments. This change makes the Curve Filter device about 10x more useful! 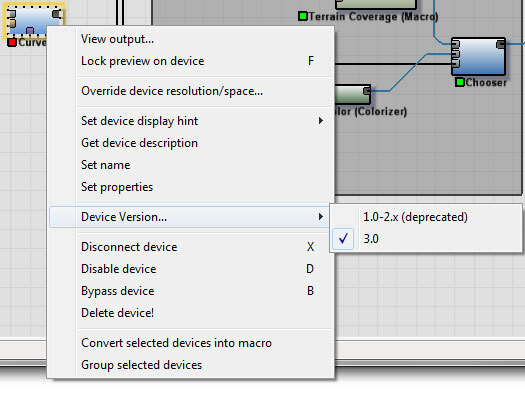 Presets are shared universally, letting you use the same curve for a layout shape that you might apply to a heightfield. 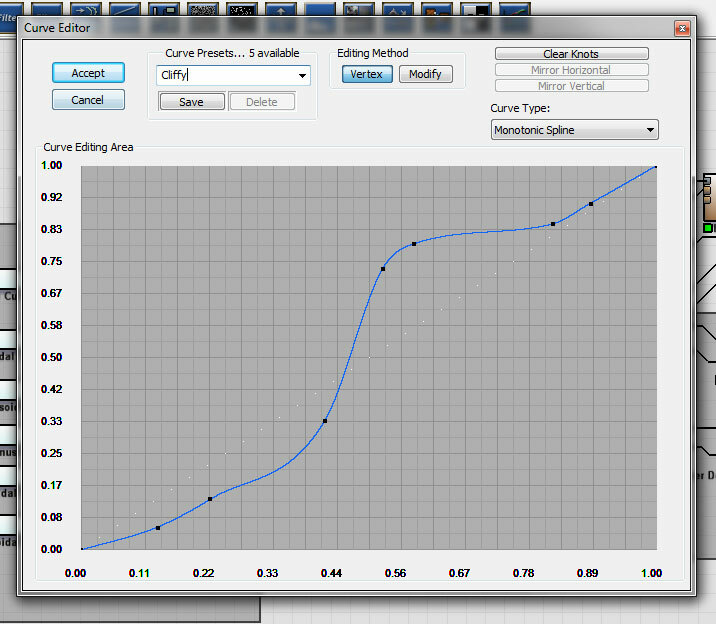 The Curve Filter is also the first device to show off the new way that we’ll handle device improvement. In the past, when device functionality changed, an import path was attempted to be created, but sometimes it was impossible to capture the old behavior while still allowing the new. The new method is to preserve old behavior in a deprecated version that will load by default in older worlds, which you can switch to a new version when you like. Note that I can’t guarantee that a deprecated version won’t go away at some point; but you’ll at least have fair warning that you’re using an old version now. This is pretty simple, but useful! I originally didn’t include this input because I didn’t think it made a large enough difference — but especially with geologic time enabled, it can certainly be a very powerful thing to control. So, that’s some exciting new stuff. The big question is, when does it drop to everyone not on the alpha team? Export of the river heightfield separately? That’s most awesome! This looks really exciting all in all!